Directed by Su Caho-Bin with John Woo as co-director and producer, 'Reign of Assassins' is set in 428AD, Bodhi, a Southern India prince became a Buddhist monk and set off for China, earning a hallowed reputation as a mystical martial artist. Following his death, his remains mysteriously disappeared. Hundreds of years later, Zhang, a high-ranking court official, is assassinated by Drizzle. 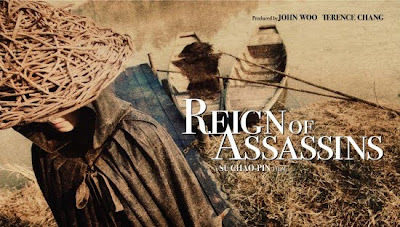 Zhang's son Jingxiu, whilst mourning his father's death, is assailed by a group assassins. They leave him for dead, but somehow he survives and escapes their clutches. Drizzle, a talented warrior herself, finds herself in possession of Bodhi's remains, and begins her quest to return them to their rightful resting place at Yunhe Temple. The Black Stone, a team of deadly assassins who employed Drizzle, are also after the remains and the powerful secret they hold. To hide from The Black Stone, Drizzle undergoes drastic facial surgery and changes her name to Zeng Jing (Michelle Yeoh). She flees to Beijing, where she meets and falls in love with Jiang, soon to become her husband. lee for their lives. As Zeng Jing kills off members of the gang while they are on the run, she quickly realizes Jiang is actually Jingxiu, and he is seeking to avenge his father's death. This leads to a lethal triangle and a fight to death between our hero Zeng Jing, Jiang and The Black Stone. The only question remains who will be the last ones standing to uncover the secret of Bodhi's remains?